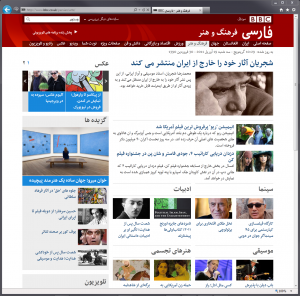 London: The BBC Persian website follows its Arabic sister site in choosing Nassim to deliver its news. It is thus the second World Service language site with a ‘complex script’ that implements the BBC’s new global visual language with its specific focus on typography as the primary design element. The choice of Nassim for this task is a great delight and honour for many reasons, but most importantly for the content Nassim gets to display. The BBC Persian is an important voice in Iran, viewed, listened to and read by roughly 3.1 million Iranians a week through its numerous media platforms (2009 estimates, current figures might be higher)*. In February 2010 half a million visitors consulted the Persian website per week, with an impressive 7.2 million weekly page impressions; bbcpersian.com receives the highest amount of traffic of all World Service websites, and it is because of numbers like these and the specific role the service plays in Iran that Newsweek cites the BBC Persian as one of the “20 most powerful people in Iran”. In the aftermath of Iran’s 2009 presidential election, BBC Persian was receiving up to eight user generated communications per minute. As videos, text messages and emails flooded in, the integrated news and information service became the focus for citizen journalism during the most serious crisis in the country since the 1979 revolution. BBC Persian gave Iranians a voice and a way of sharing information, as well as providing a source of fair and balanced news. Carrying the news in Persian thus amounts to a big responsibility, and in order to fulfil this role appropriately, Nassim was revisited and modified to cater best to the specificities of Persian typographic customs. In close collaboration with the Persian language service, and with the support of my own historical research, I redesigned the most typically Persian letters. Based on archival sources at the University of Reading, I redrew Nassim in a more typically Iranian ‘flavour’ and adjusted the programming accordingly. The resulting version gives the website a distinctly Iranian look, whilst maintaining the coherence with the brand’s global visual language and the Arabic sister site. The following image shows a selection of the most recognisable revisions of typeforms. In addition to substantial design modifications such as seen in the Keheh and Mim, I introduced a number of more subtle adjustments, such as the contextually sensitive dot positioning of initial Yeh and Peh, illustrated with the below graphic. The active engagement of the Iranian audience with the channel, as well as the aggressive crackdown by the authorities on the BBC and international media in general, underline their importance in a country that is experiencing substantial political and societal upheavals. Provision of reliable, accurate and unbiased news is a global challenge — but its role in the Middle East is of epic proportions. The events of recent months redefined the region and gave ample proof of the power and importance of journalism and the free exchange of information. Whilst it is clear that the reasons that triggered the revolutions of the Middle East were manifold, it seems fair to say that the publication of information through Wikileaks, and the revived notion of citizen journalism in combination with the facilities of on-line social media, all supported and reinforced a public movement for change. Mainstream news providers react and reposition themselves in view of these developments. Their roles change, and if the opportunity is embraced, the new situation ideally creates a dynamic symbiosis in which both spheres of information-supply complement each other. For someone with a keen interest in the Middle East, these are exciting times of hope and potential. For me as a typographer, helping to bring news from a respectable source to the world is an important goal in the typographic profession. In my opinion, such contribution, as small as it might seem, is the most relevant typeface design can get, it is the moment at which the recurring question whether type design is able to make a difference most strikingly gets an answer. And thus, seeing the news of these last months, from Tunisia in December, to Tahrir in January, to Mubarak’s resignation on the 11th of February 2011 set in Nassim on the BBC Arabic website, made for the highlight in my professional career. From today, Nassim will help to bring the news from Iran to Afghanistan, and in the hope that Nassim will fulfil its task well I send my warm regards to the 70 million Farsi readers worldwide.